“A Sticker for You” is a self portrait using markers and pens. 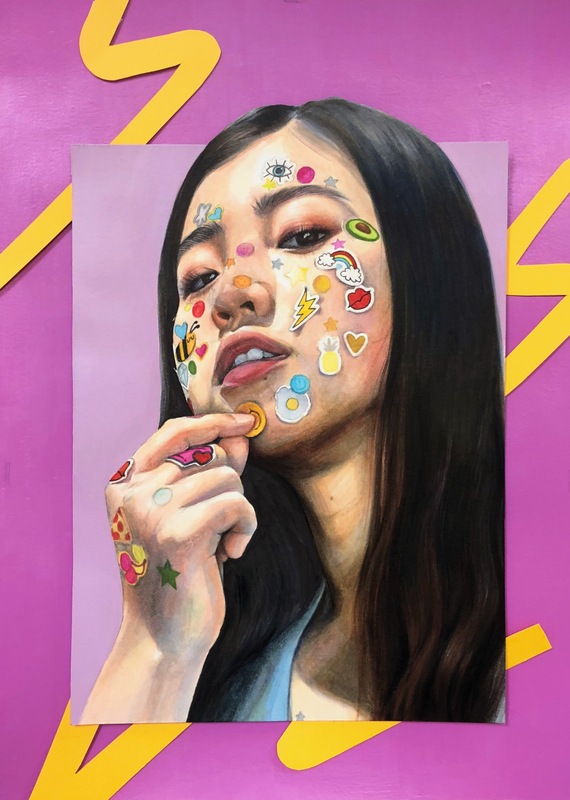 In this piece, I chose to draw an image of my face covered in stickers because stickers, believe it or not, have played a huge role in my life. When I first came to the United States in fifth grade, I neither knew how to speak English nor did I feel particularly inclined to learn it. However, my tutor found a way to make me want to finish all my grammar and reading worksheets by giving me a sticker for every sheet I finished. In this way, I was motivated by my desire to collect as many Hello Kitty, Avengers, and glittery stars stickers as I could to learn English and work towards my goals. Ultimately, these stickers became a part of my identity as they served as the reason I learned English as well as the catalyst for the work habits I have developed over the years. Ava Wang is a senior at the Westminster Schools in Atlanta, Georgia. She has works recognized at the city, state, and national level by Wildlife Forever, the PTA Reflections, and the River of Words. She is the Teen Ink Summer Issue Cover Art Winner, Teen Ink #1 Top Voted Photo Winner, and the winner of multiple Editor’s Choice Awards. Her works are also displayed at the Hartsfield Jackson Atlanta International Airport as well as the High Art Museum every year and had been published in multiple Embryo and Teen Ink Magazines. Additionally, she is the head editor for her school’s arts and literary magazine, the founder of Art Heals Foundation, and a board member of the Together, We Can Foundation. She also enjoys teaching her after-school art class at ASK!